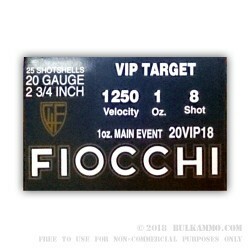 This 20 Gauge shell by Fiocchi Munizioni is loaded with 1 ¼ ounces of #4 lead shot. The approximately 169 .13” diameter pellets in this shell are all nickel plated, which hardens them to help them resist deformation while traveling through the barrel. They keep their round shape as the result, promising good, even patterns even at long distances. With its muzzle velocity of 1,200 fps, this shell is perfect for hunting the bird on its packaging, the pheasant. Its shot size is appropriate for geese and turkeys as well, as it is big enough to reliably puncture those bigger birds’ thicker plumage. You may also consider chambering it in your home defense shotgun. It’s great because it likely won’t penetrate a wall, reducing the risk of jeopardizing bystander safety, but still packs the punch needed to deter a human-sized target. Fiocchi is one of Italy’s biggest manufacturers, and owes their success to the care they put into their products. Their shells’ thick plastic casings, uniform and reliable primers, and clean burning American powders will add tremendous value to your next bird hunt.